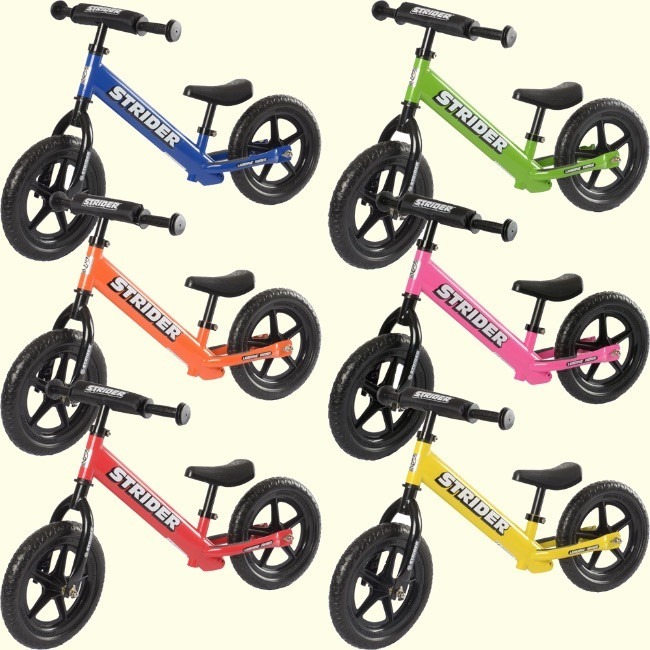 In this balance bike review we look at the Strider 12 Sport range of no-pedal bikes. Strider have been around since 2007 and have been the market leader selling over 800,000 since then. They even now make a Strider 12 pro range which are top-end and made of pure aluminum, so they never rust! The ST-4 Model here is a mid-priced bike backed up by all the expertise of the Strider company who are top specialists in this field. The frame is made of powder coated metal and comes in at an impressive 7lbs or 3kgs. The thing that I like about the Strider design is its low centre of gravity that helps the rider keep their balance. It is designed really well so that the rider gets a really good posture of leaning forward with their elbows slightly bent. This confidence builder is really important as kids will get the hang of it quite quickly. As we all know, if something takes time to perfect then little kids can lose confidence and turn their interest to something else. This is where I was a little disappointed with the bike, they come equipped with 12” foam tires. This does mean that they will not puncture or need inflating like air tires but that is a poor trade off as they wear out quite quickly and do not grip very well. This is not so much a problem when they are starting out, but when they get more confident and start racing around at high speed they will slip! They do have sealed bearings and the ride does seem to be quite smooth. One small issue is that the bolts are not recessed and although not sharp they could catch a leg in a fall, but perhaps all but the bravest of kids would not find this a problem, mine certainly don't!. The seat adjusts from 11” to 16” (28-41cm) which is lower than the FirstBIKE so smaller children will be more comfortable on the bike and we think it's best for 18 months to 3 or 4 years old. On the Strider 12 Sport model, they have recently replaced the foam covered seat that was nice and comfortable with a hard plastic seat that is not quite as comfortable, however it is more durable as the foam seat did used to tear a bit too easily. Strider have stated they replaced it due to the foam seats getting ruined rather easily; however I don’t buy that as you can purchase the old style seat from their website. so that the bike can grow with your child and it’s easily adjustable via a hex screw, that said this is a minor gripe and from what I have seen, children don’t seem to be overly bothered by the new seat and it is narrower so allowing more unrestricted movement of the legs. It’s a good sturdy little balance bike that has many good features going for it like the low centre of gravity, its light for a metal frame it does have good cushioning on the ends of the handle bars that will protect both your child and whatever the handle bars fall on. There is no steering limiter but like I have said before it should not be a huge factor in your decision process as your child will quickly learn how to steer. You can adjust the handle bar up from 18” to 22” (46 to 56cm) unlike the FirstBIKE, so this bike will grow with your posture as your child grows. 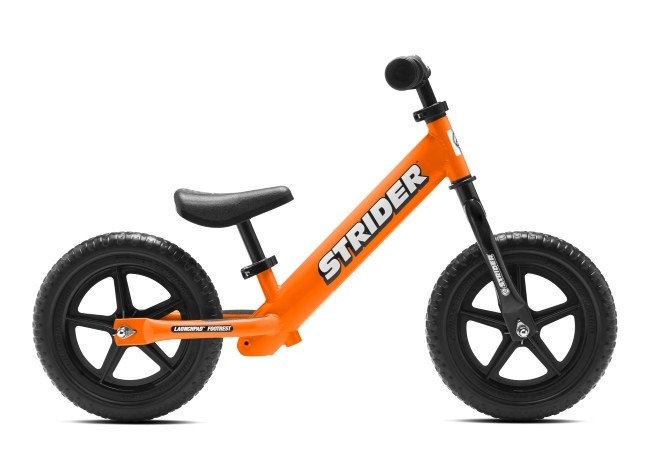 The range includes the Strider 12 Sport (featured) The Sport that does include the longer 19” (48cm) padded saddle, a smaller width handle bar and that’s about all I can see. with quick release clamps and they are still sticking with the foam tires which is a shame. 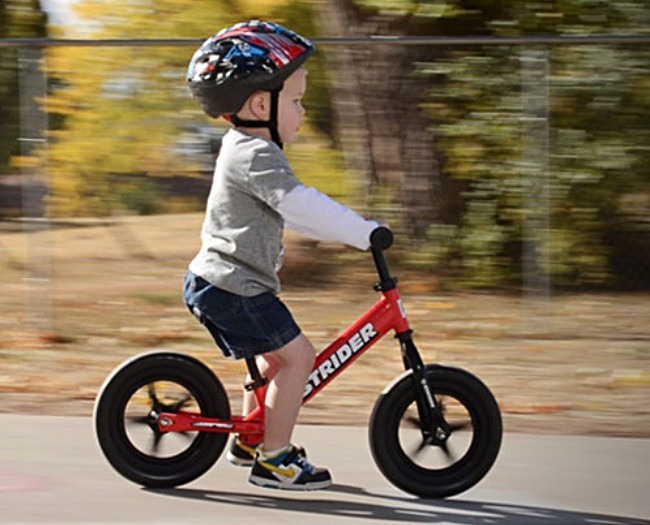 One of the things that I like about Strider balance bike and should be mentioned in this review is that they are very community orientated and they put on their Strider championship racing days which I think are fantastic and really get the kids into competitive activities. So be sure to see if they have an event near you! I love Strider as they are among the most innovative companies in the market. Take a look at the rest of our best balance bikes reviews and find one that suits your toddler.